The magnificent Pinter At The Pinter line-up reaches a crushing crescendo with Betrayal, a masterpiece of a season finale. And, due to massive public demand for tickets, the show has extended for an additional week at the Harold Pinter Theatre. Directed by Jamie Lloyd and starring Olivier and Golden Globe Award winner Tom Hiddleston, Betrayal will now run at the Harold Pinter Theatre until 8 June. Opening at the culmination of a passionate fling, Betrayal follows three friends caught in a love triangle over seven years, charting their relationships in reverse chronological order. Powered by hindsight, each revelation invites rich humour – but also extraordinary emotional force. 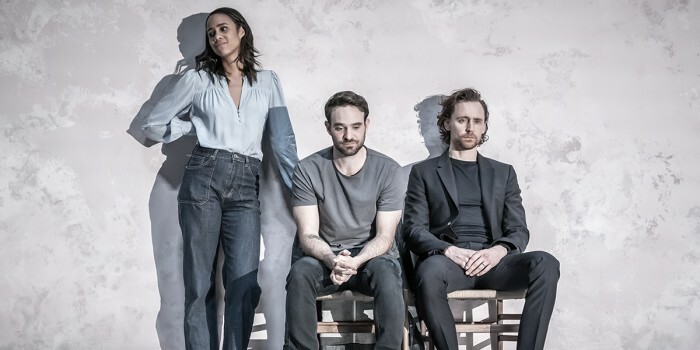 Tom Hiddleston, Charlie Cox and Zawe Ashton are ferocious in Jamie Lloyd's revival of Betrayal, which opened at the Harold Pinter Theatre tonight. The landmark production marks Tom’s first appearance on the London stage since portraying Hamlet directed by Kenneth Branagh. He plays the role of Robert, opposite Zawe Ashton (Fresh Meat, Not Safe For Work) as Emma, and Charlie Cox (Marvel’s Daredevil; The Theory Of Everything) as Jerry. The show is the finale of the Pinter At The Pinter season, which began in September and marked the 10th anniversary of the revered playwright’s death by presenting all of Harold Pinter’s all one-act plays. You can find out more about Pinter’s life and career here.